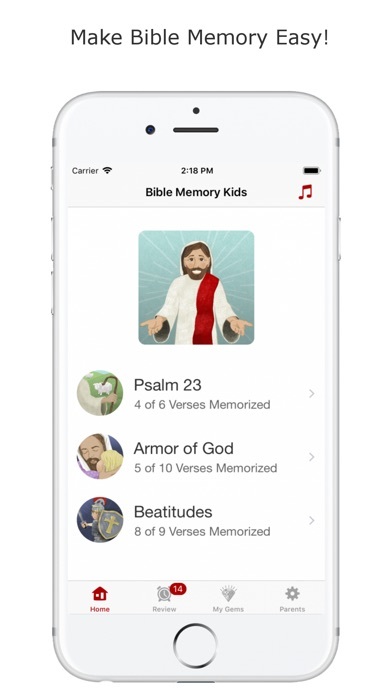 From the maker of Scripture Typer, the #1 Bible memory app, comes Bible Memory Kids! Bible Memory Kids makes Bible memory fun and easy. Kids can memorize by themselves, even if they can't read! Proven Deep Learning Engages 3 Areas of Sensory Memory: • Mnemonic images engage visual & spacial memory • Scripture songs engage auditory memory • Single-key, simplified & guided typing engages kinesthetic (touch) memory Kids grow stronger in the Lord by memorizing foundational, extended passages from the Bible: • Psalm 23 • The Beatitudes from Matthew 5 • The Armor of God from Ephesians 6 • More to come (at no additional charge!) Each passage has beautifully illustrated artwork and exciting music to accompany every verse, carefully designed to hook the verse in long term memory for easy recall. You can also add your own verses! • Record your child singing or saying any verses you add. Kids can type their verses, as well. Only the first letter of each word is typed. The light-up keyboard highlights exactly which key to type, helping even youngest child to catch on! In addition to memorizing Bible verses, they’ll also learn the location of each letter on the keyboard. You’ll have fully fledged typists in no time! 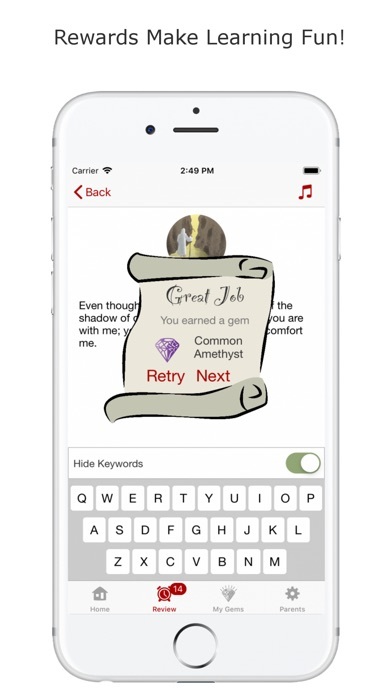 Fun Rewards: Your kids will earn priceless gems as a reward for typing their verses. Smart Review System: After memorizing a verse, you’ll be reminded to review it in the future, as needed. A smart review cycle helps focus on verses that need review most, while using a less frequent schedule for verses your child knows well. Multi-User & Family Friendly: Create unlimited accounts and easily swap between users. All child accounts are stored under a single login, which is managed by the parent. Multi-Device Sync: Your progress will sync between all of your devices. Offline Support: You can memorize anytime, anywhere, even without the Internet! Everything will sync back up the next time you have an Internet connection. Give your child a strong foundation, and equip your child for life in Christ. Get Bible Memory Kids today! Scripture quotations are from the ESV® Bible (The Holy Bible, English Standard Version®), copyright © 2001 by Crossway, a publishing ministry of Good News Publishers. Used by permission. 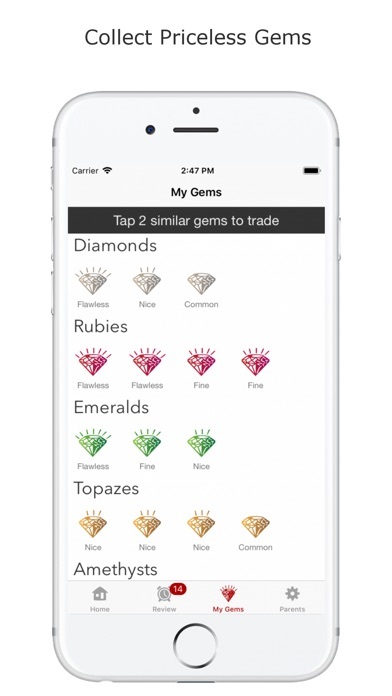 Beautiful work and nice features introduced like the icons and key hints. The version was not familiar and this made the experience less challenging...missing points or gems because of the “wrong “ word got old. Once those features are updated...I will be back to learn more. Thanks! There are only three pretty basic passages available on this app and no option to add others. It’s not helpful for kids trying to memorize specific passages. I should have looked this over before approving the download. It only has a few verses. I was thinking it was just like the adult version. My kids use the app for memorizing their awana verses, can’t do that with this app. Maybe more verses/the rest of the Bible will come later. 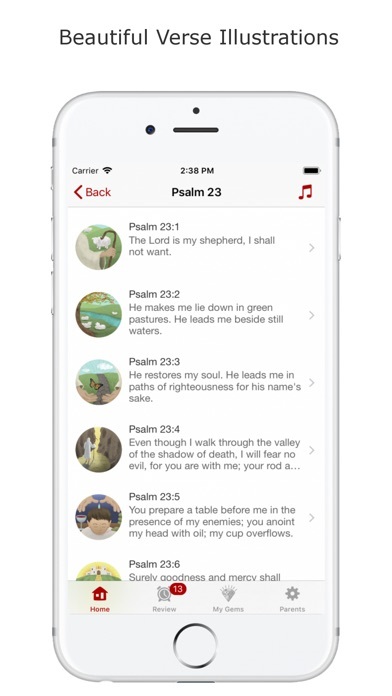 This Bible Memory App for kids is full of cool features! I love the artistic illustrations, the verse categories that children can understand and enjoy learning, plus the musical touch is so creative and fun! That’s one of the best ways that kids can learn. My 4 and 2 year old are loving it, and so am I! 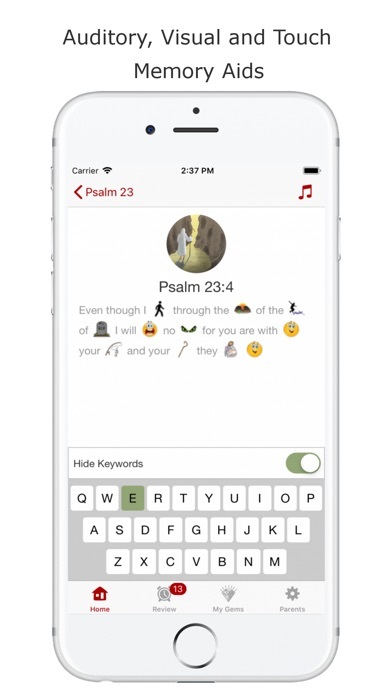 Nice visuals and reward system makes memorizing verses easy and fun! The music is a nice touch! Best Way to Memeorize Scripture! This app is the best way for kids to memorize scripture. Get it! You won’t be disappointed!